Right up until Sunday, the U.S. had enjoyed a historically quiet tornado season. That all changed very quickly, and the worst could be yet to come. For three days this week, dozens of twisters raked across the South and Plains, killing 38 people and destroying hundreds of homes. 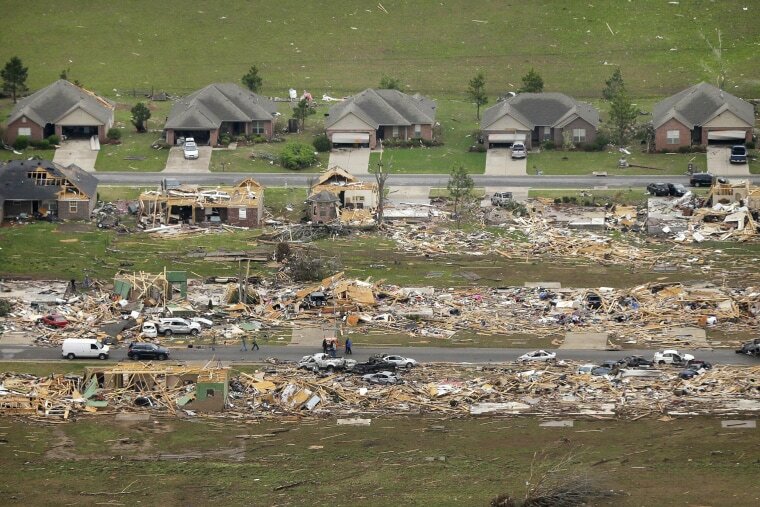 April and May are the busiest time of the year for twisters, particularly the deadly ones. Historically, the number of tornadoes spikes in the two months, according to more than 40 years of National Weather Service data. It's early enough that the jet stream of air flowing down from Canada is still cold and lively. At the same time, it's late enough into spring that air flowing north from the Gulf of Mexico has had enough time to heat up. And it's in April when those two streams generally start clashing over the Gulf Coast states, creating "a lot of tornadoes, and a lot of killer tornadoes," in places like Louisiana, Mississippi and Alabama, said Greg Forbes a severe weather expert for The Weather Channel. As you get into May, those collisions happen farther north, generally speaking, over states like Kansas, Nebraska and Missouri and northern parts of the Tennessee Valley. That's what happened last May over the region around Moore, Okla., when cold and warm air came together to produce an almighty EF5 tornado packing wind speeds of 210 mph — almost three times hurricane strength. More than 50 people died. While "the size of a tornado doesn't necessarily correlate well with its strength," said Greg Postrel, a forecaster for The Weather Channel, EF5s are responsible for 52 percent of all deaths, even though they make up only about 1 percent of recorded tornadoes. The U.S. has had a remarkably low number of tornadoes in 2014. Until Sunday, the weather service had recorded the fewest since reliable records using modern statistical methods began in 1950, according to National Weather Service data. And no one had died anywhere in the country until a North Carolina infant, who'd been injured by a tornado Friday, died at a hospital Sunday. That's the latest into a year that's happened since 2002. But with 38 people having been killed since Sunday, "I would say the past couple of days have made up for it," Pat Herald, a meteorologist for the weather service, told NBC station WTOV of Steubenville, Ohio. And "we're just moving into the peak period now," he said.